Due to the latest developments in electronics industry, the emerging multimedia applications are smart, efficient as well as sensitive to the deployment constraints. The intelligent and soft computing techniques provide scalable and energy efficient multimedia solutions. The emerging multimedia tools can be used for various pervasive and ubiquitous applications such as health care, environmental monitoring, security and surveillance. This special issue includes 12 papers relating to these emerging applications. In the paper titled “Stereo Panorama Acquisition and Display for Virtual Tour Systems,” Huang and Klette investigate methods for determining optimum parameters both for high-accuracy stereo panoramic image recording and displaying. They focus on automatic image disparity enhancement while displaying a stereo panorama. The experimental results show that these parameters are critical for ensuring high quality stereo viewing. The derived formulas are applicable in technologies for stereo panorama imaging or stereoscopic displaying. Xiao et al. present “A Group of Novel Approaches and a Toolkit for Motion Capture Data Reusing”. They propose approaches for posture feature representation, motion sequence segmentation, key-frame extraction and content-based motion retrieval, which are very important for Motion Capture (MoCap) data reusing. In paper titled “A Portable Toolkit for Supporting End-User Personalization and Control in Context-Aware Applications”, Kawsar et al. address the personalization and control issues at the system interface level in parallel to context centric design. They present a toolkit that provides support for extending context-aware applications with end-user personalization and control features. The toolkit can be used with various existing middleware. Further, the existing context-aware applications can be augmented to provide end-user personalization and control support. Han et al. provide “Music Emotion Classification and Context-based Music Recommendation”. They propose a novel emotion state transition model (ESTM) to model human emotional states and their transitions by music. They also present context-based music recommendation (COMUS) ontology for modeling user's musical preferences and context, and for supporting reasoning about the user's desired emotion and preferences. For mapping low-level features to ESTM, they collected various high-dimensional music feature data and applied nonnegative matrix factorization (NMF) for their dimension reduction. In paper titled “A New Unequal Error Protection Scheme Based on FMO,” Shih and Tsai present a novel scheme for video transmission over error-prone networks. The proposed scheme is based on the error resilient features of H.264/AVC and employs an unequal error protection (UEP) approach to protect effectively the streams. They classify macro blocks into slice groups using the explicit mode of Flexible Macroblock Ordering (FMO). Further, a Converged Motion Estimation (CME) is used to improve the proposed UEP scheme. Hakkoymaz presents “Multimedia Presentation Organization and Playout Management using Intelligent Agents”. A model is proposed for organization, computation and management of automated multimedia presentations based on active multimedia segments retrieved from a multimedia information system and the Web. Based on event-point representation, three methods are given for playing out the constructed presentations at the presentation terminal. In paper entitled “An Automatic Feature Generation Approach to Multiple Instance Learning and Its Applications to Image Databases”, Cheng et al. propose a novel learning technique which transforms the MIL problem into a standard supervised learning problem by defining a feature vector for each image bag. With this new image representation, standard supervised learning algorithms can be applied to classify the images into the pre-defined categories. Kovacevic et al. present “Adaptive Content-Based Music Retrieval System”. It is a tunable content-based music retrieval (CBMR) system, which is suitable for retrieval of music audio clips. The audio clips are represented as extracted feature vectors. It improves the retrieval performance genetic algorithm based tuning process. For efficient retrieval of audio clips, the R-tree index is based on the clustering of feature vectors. The proposed CBMR system implements the point query and the n-nearest neighbors query with the O(log n) time complexity. Different objective functions based on cluster similarity and dissimilarity measures are used for the genetic algorithm. Kolekar and Sengupta investigate “Semantic Concept Mining in Cricket Videos for Automated Highlight Generation.” They automate highlight generation of broadcast sports video sequences from its extracted events and semantic concepts. The proposed method extracts event sequence from video and classifies each sequence into a concept by sequential association mining. 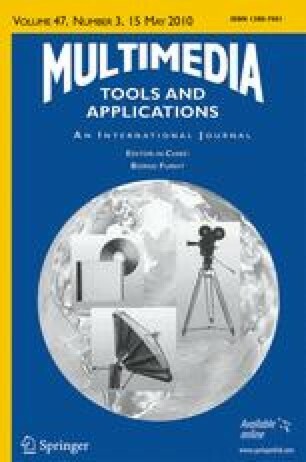 In paper entitled, “A Multimedia Application for Watermarking Digital Images Based on a Content Based Image Retrieval Technique”, Tsolis et al. investigate the implementation of a robust multimedia application for watermarking digital images. The proposed technique is based on an innovative spread spectrum analysis algorithm for watermark embedding and on a content-based image retrieval technique for watermark detection. It combines the advantages of both "detectable" and "readable" watermarks. Batko et al. present “Building a Web-scale Image Similarity Search System”. They investigate a similarity search system on a test collection of more than 50 million images. They address the challenge of obtaining a collection of images of this scale with the corresponding descriptive features. They also develop scalable indexing and searching mechanisms and answer similarity queries in real-time. In paper entitled “Simulated Evaluation of Faceted Browsing based on Feature Selection”, Hopfgartner et al. explore the limitations of facet based browsing which uses sub-needs of an information need for querying and organizing the search process in video retrieval. They reduce the dimensionality of features by selecting the most important ones. Facets created by users are simulated by clustering video shots using textual and visual features. Finally, we would like to thank our reviewers, the organizers of the Second International Conference on Multimedia and Ubiquitous Engineering (MUE), and the editorial staff of JUCS journal.